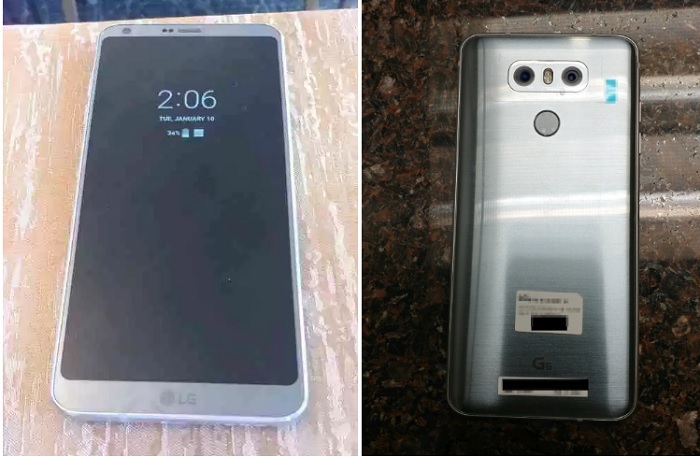 The LG G6 leaks just won’t stop making rounds on the Internet. We have already seen live images of the G6, but, the images that have leaked now show off the always-on display of the device. Design wise, the images match what we have seen in the past. Rounded screen corners, small bezels, dual rear camera setup and fingerprint scanner at the back. The image of the G6 that has leaked today shows off the device in silver color along with metal finish. You can also see slight curves along the edges (at least that’s what it’s looking like) at the back. Also seen is the G6 moniker below the back of the device. Like we said, this is what we have already seen, however, what’s new is the always-on display. The image shows off the always-on display functionality of the G6. Well, this isn’t new though as its predecessor, the G5, too had it. This functionality is also available on Samsung’s flagships that were launched last year. Also, talking about the display, the G6 is said to sport a 5.7-inch QHD+ FullVision display which will have a resolution of 2880 x 1440 pixels and 18:9 aspect ratio. The source who shared this image with 9to5Google has shared some specifications of the device as well. According to the source, the G6 will be powered by Snapdragon 821 SoC, have 4 GB RAM, boast 5.7-inch display that we mentioned above, 32 GB of base internal storage and 3200 mAh battery. Apart from this, LG has teased the G6 to be dust and water-resistant and has also confirmed the presence of Quad DAC for better sound quality. Besides this, the G6 is also rumored to be the first non-Pixel phone to come with Google Assistant built-in. The LG G6 will be unveiled on February 26, but, we don’t expect the rumor mill to stop any time soon.